Blinking in the bright light, we filed out of the dark hemlock grove onto the sunny bog boardwalk at the Forest Lodge Nature Trail. 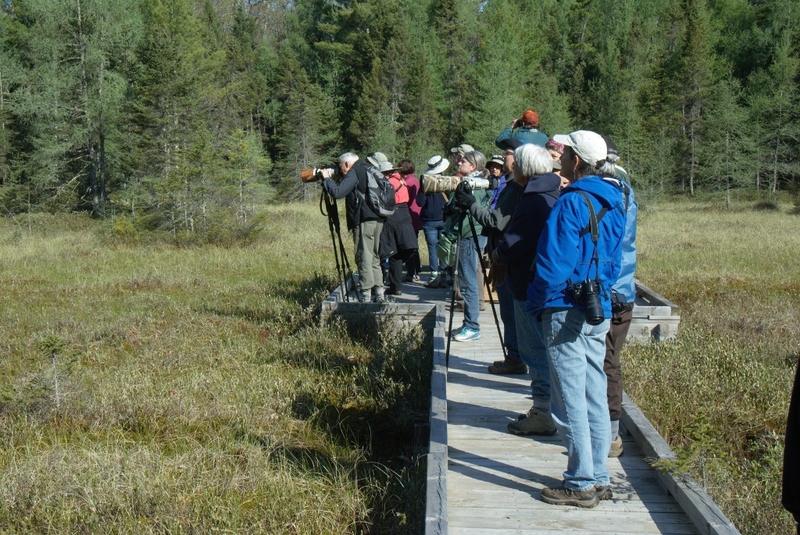 Little bubbles and strange noises rose from below as the boardwalk’s supports sank into the peat under the weight of 27 birders from the Chequamegon Bay Birding & Nature Festival. We listened intently for a bit, scanning the tree line for flitting warblers. Already that morning we’d seen or heard at least 16 species of birds, and now-familiar calls rang through the trees. A black-throated green sang his “I am black-and-green” from one side while a blue-headed vireo fluted sweetly from across the way. Ovenbirds shouted their “teacher, Teacher, TEACHER!” from all directions. And then, from the little clump of trees in the bog’s center, came a rich warble that made us pause. The complex song was a jumble of high-pitched notes, rising phrases, and short trills. Usually, I rely on mnemonic sayings from John Feith's Bird Song Ear Training Guide to pop into my head and guide my bird identification. But I’ve been playing the warbler section of the CD on repeat in my car for a month now, and no helpful mnemonic came to mind. The voice reminded me a bit of a song sparrow, who also has a complex song, but begins with a distinctive 2-3 note introductory phrase. “Maids, maids put on your tea kettle-ettle,” says the CD helpfully. 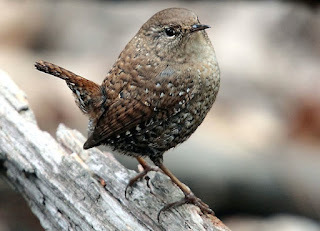 It also brought to mind the driving song of the winter wren, but without the same level of intensity. Finally, someone got a fluttering glimpse of a brown-and-white streaked bird with a faint dark spot on its breast. Another birder matched that with his knowledge of sparrows who might live in a shrubby bog, and the name Lincoln’s sparrow floated around the group. Whipping out my brand-new smartphone with the Audubon birding app, I clumsily found the Lincoln’s sparrow entry and played a snippet of his song. A perfect match. How many birders does it take to identify a Lincoln’s sparrow? Apparently 27. Now the hunt was on. We scanned the cluster of trees and shrubs intently, waiting for some movement to give away his location. Suddenly, he flew up from the low thicket of leatherleaf and landed on the sparse branches of a little tamarack tree. Its soft, young needles framed him perfectly, showing off a bit of warm tan color among the brown streaks under his chin. Then swoop! He darted off toward a different brushy cluster of trees and belted out his (now familiar) song a few more times. This bird of the brush breeds in northern and mountainous areas in scrubby, dense vegetation near water, usually above 3,000 feet in elevation. 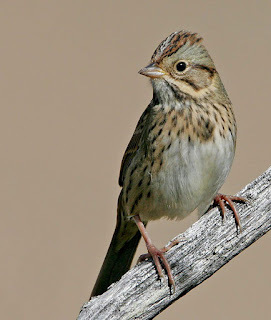 Lincoln’s sparrows are especially drawn to willow thickets for nesting. Northern Wisconsin is at the very southern edge of their breeding range, but this bog looks a lot like its preferred habitat, despite our much lower elevation at 1,400 feet above sea level. While his song reminded me of the winter wren in some ways, it is completely different in others. The winter wren’s regional “accents” are enough to divide it into separate, though similar, species; the Lincoln’s sparrow has little geographical variation in its song. Scientists believe this is because juvenile Lincoln’s sparrows disperse far and wide, effectively homogenizing their population. Not much else is known about this sparrow, though, since its behavior, habitat, and similar male and female plumages make it difficult to study. You can bet I’ll be checking back later, without a posse of 26 birders, to see if this vociferous little sparrow is a resident, or just passing through. Lincoln's sparrows tend to hide in dense brush, where there brown streaks make great camouflage. Photo by Mike Daley. Birders from the Chequamegon Bay Birding and Nature festival look for the singer of an unusual song in the bog on the Forest Lodge Nature Trail near Cable, WI. Photo by Larry Stone. The symphony of spring grows richer every day. Stepping out my front door this morning, a blast of birdsong overwhelmed my senses. The translucent, glowing greens and pinks of newborn leaves were muted by low, gray skies, but the warblers’ songs lit up my brain with a rainbow of synesthesia. The upward buzz of the northern parula, who just arrived on May 12, (four days later than in 2015) sounds blue-gray with yellow and orange highlights. The sweet warble of a Blackburnian warbler sounds blaze orange as it ends in a high pitch I can barely hear. The “I, am, black-and-green” song of the black-throated green warbler sounds (what else?) like alternating dashes of black and olive. Ok, so maybe I don’t have synesthesia, maybe it’s only that the bird songs trigger their photos in my mind, but the dreary morning felt decidedly colorful with the addition of so many perky songs. These warblers are not known for being quiet. And yet, when the winter wren chimed in with his ringing, clear stream of tinkling notes, the other songs faded into a background jumble. This four-inch-long, one-half-ounce, drab-brown bird of the forest floor can sing with 10 times more power than a crowing rooster per unit weight. He’s been singing here for weeks now (only needing to migrate from the southern U.S.), and—although I’m excited for the new arrivals—his song still gives me a thrill. Partly, I (and the lady wrens) am drawn to him by the power of his song, which can last up to 8 seconds as he bellows notes while both exhaling and inhaling. Party, I’m intrigued by the mystique of this tiny, well-camouflaged bird that spends his time scurrying through the underbrush with mouse-like hops. The scientific name of the winter wren (Troglodytes hiemalis) means winter-loving cave-dweller, but their caves are hollows and cavities in dead and fallen trees. What do they look like? A little brown blur that sometimes congeals into a short, perky, twitching tail. Only through the patience of photographers do I know that they have tiny, white checkers on their brown background, a white eyebrow, and light-brown legs. My favorite birds are the ones who kept me company during my transient years, when I worked back and forth across the county from California to Maine. I didn’t grow up hearing winter wrens in Iowa (house wrens are more common there). I first knowingly heard one in the Boundary Waters of northern Minnesota, which automatically endeared them to my heart. On still mornings, their energetic songs would resound across glassy lakes. When I moved to the redwoods of California, my morning jogging route took me right past the territory of a wren near a tiny stream. They love riparian areas with tangled underbrush. It was exciting—in such a drastically different forest—to hear a bird I recognized easily. I was also thrilled to hear the familiar voices of song sparrows while we took kids tide-pooling along the ocean. The song sparrows didn’t sound quite like the ones I was used to back east, although their tone and cadence were quite identifiable. It’s well known that many birds, like people, have regional variations in their songs. 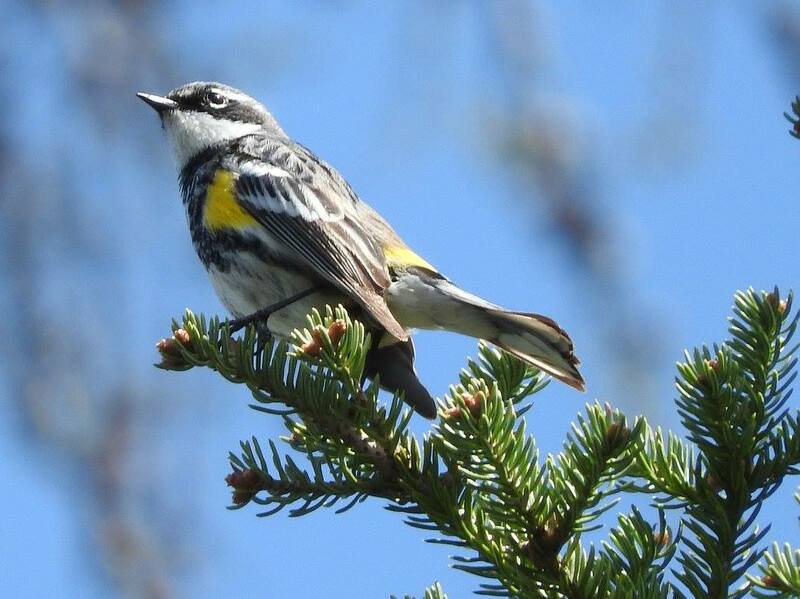 A Minnesota friend who recently headed to West Virginia for a birding trip joked that she’d be hearing warblers with southern accents. The winter wren song sounds like such a jumble to me that I can’t hear the regional variation. The lady wrens can hear it, though. Several years ago, a couple scientists set out to study the variations in several subspecies of winter wrens across the country. Birders had already noted that the wrens in the eastern U.S. sound more like wrens in England, and the western wrens share more characteristics with their colleagues from Siberia. They are a widely distributed species! Or are they? Where the eastern and western types meet in eastern British Columbia, they hold neighboring territories. The males will respond to any wren’s song with territorial aggression, but the females only mate with males who sing the appropriate song. I’ve tried to hear the difference, but the nuances are lost on me. Only by looking at sonograms (technological synesthesia!) can I be as discerning as those lady wrens. You can see them for yourself, and read an excellent summary of the research at: www.slybird.blogspot.com/2008/07/winter-wren-is-multiple-species.html. And, seeing as how I wouldn’t last a minute trying to be a discerning lady wren, I will just call him a lovely sign of spring. Birdsong and sunshine poured through open windows this morning, wafted in on a warm breeze. It was the distinctive call of a black-throated green warbler that finally lured me outside. “Zee-zee-zee zoot-zee” he shouted. “This is my territory and don’t forget it!” “Welcome home!” I felt like yelling back. Several other melodies joined his refrain: the trill of a yellow-rumped warbler (a song I’ve been hearing for a few weeks already); the “Hey Sweetie” of a black-capped chickadee (I’ve been hearing that since January); and the tinkling stream of clear notes bellowed out by a winter wren with incredible breath control and no desire to let you get a word in edgewise. 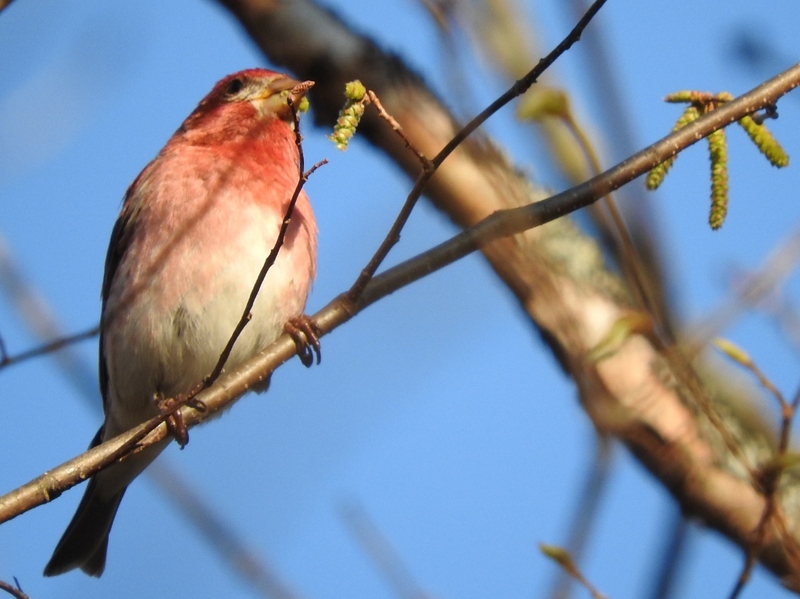 A pair of phoebes, and a few other mystery birds, also contributed their verses to the epic ballad of spring. As I scanned the treetops to catch a glimpse of the feathered minstrels, I noticed with dismay that the maple trees were glowing brightly with tiny, translucent baby leaves among big clusters of dangling flowers. New life is beautiful, but leaf-out makes birding that much harder. I also heaved a sigh at the swarm of freshly-hatched black flies vying for my blood. Some signs of spring are not so pleasant. It’s good for the migrating warblers, though, that the insects (and food for the insects) the birds need to eat are hatched and/or growing. When the long-distance migrant birds react to changing day length in South America and start their journey north, they have no way of knowing what weather will await them on the next continent. If we have an early spring up here, they can’t get bumped up to an earlier flight. If we have a late spring, they don’t get a text notifying them that their flight has been delayed. These long-distance migrants tend to arrive like clockwork each spring, with very little change in their arrival dates. What variability occurs is mediated by the weather. As the birds head toward their breeding grounds, storms and lack of food will slow them down in a late spring, while favorable conditions will encourage steady progress north in an early spring. While the weather this spring has been lovely for a few weeks now, this is the first morning I’ve heard the black-throated green warbler, who started its journey in Central America. The yellow-rumped warblers (here for a while now) may have only been wintering in the southern U.S. The blackburnian warbler (a striking, bright-orange firecracker) is still on its even longer journey from South America. It will probably arrive on about the same day it did in 2013 (May 15) even though that was the year I went cross-country skiing for my 50th day of the year on May 4. In the meantime, the plants (who can’t go south for the winter) are controlled more closely by spring temperatures—although some regulation by day length plays a role in protecting them from blooming during a January thaw. I just photographed a plethora of spring flowers at St. Peter’s Dome. On Mother’s Day weekend 2013, I was snowed on while searching out a few spikes of furled leaves just emerging along that trail. 2013 was a great year for birding, though, because the birds came back all at once before the trees had a chance to leaf out. Visibility was amazing! Food-finding was probably a challenge for the birds, though, since local insects are also more responsive to temperature than day length. Spring weather is always variable, but as climate change strengthens, the variability will trend earlier. Short-distance migrants might be able to shift their patterns and stay in sync with plants and insects on their breeding grounds. Researchers have found that the adaptation doesn’t happen within individuals, though. Individual birds arrive at the same time, year after year. Instead, natural selection favors the birds that are programmed to arrive earlier. They have more babies with similar, early genes, while the genes of their late-arriving peers go back to the dust. I’ve seen a similar sentiment in a political meme floating around the internet right now, a quote by Arturo Albergati: "People don't change their minds. They die, and are replaced by people with different opinions.” While this seems a little morbid as I stand surrounded by glowing, singing, flowering, buzzing life in the most vivid season of the year, that adaptation through natural selection is actually a key to the future of life. Observing seasonal events is also known as phenology. Come visit the Museum’s brand-new exhibit about phenology: “Nature’s Calendar: Signs of the Seasons” to learn more! Check our Calendar of Events for phenology journaling programs to inspire you to record seasonal events from year to year. Birders are often torn in spring. We want the migrants to have enough food when they pass through or arrive on territories, but we also prefer to be out with the woods unaccompanied by the birds' food source: black flies and mosquitoes. In addition, once tree leaves expand, birds become harder to see. Photo by Emily Stone. 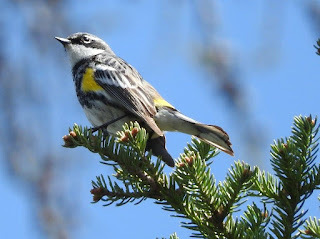 Yellow-rumped warblers have been vocal and visible for several weeks already. He's so handsome!!! Photo by Emily Stone -- from a moving canoe! A birch twig tinkled musically in my spokes as I cruised along a mountain bike trail on opening day. Winter winds had sprinkled debris liberally over the ground, and one stick or another was caught noisily in my wheel for most of the ride. Peepers and chorus frogs rounded out this aria of the Symphony of Spring. This particular twig wasn’t falling out on its own, so I stopped briefly to help it on its way. As I planted my toe on the ground for balance, an odd, brain-like shape next to it caught my eye. The brownish lump would have perfectly matched the “burnt sienna” crayon in my 96-color set from third grade. I always loved that color. As an identification started to coalesce in my subconscious, I picked up the mass. Just as I expected, the cool, smooth, mushroom cap crumbled in my grasp. The convoluted undulations of the cap became shards on the ground, and I was left holding the stouter, paler stem. While most mushroom fanatics rave over the spring crop of morels, and even novices who don’t pay attention to any other mushroom sauté that holy grail in butter and garlic, all I ever find are these false morels. These early spring mushrooms (sometimes sprouting under melting snow) grow on sandy soil under pine trees and seem to prefer disturbed places, such as trailsides. While the convoluted cap of this imposter looks superficially like morels, it is easy (and important) to tell them apart. For one, the lumps on the caps of false morels bulge outward. On true morels, the texture is formed by pits sinking inward. When sliced in half, one discovers that the cap of a true morel is fused along the entire length of a hollow stem. In contrast, the cap of a false morel is attached only at the top of the stem, and the stem itself is filled with either mushroom flesh or cottony mycelia. I know how tempting it is to make a “hopeful” identification when you really want to find a particular species. A few years ago, I saw a lumpy mushroom cap hiding among spring flowers, and exclaimed “morel!” before looking more closely. Luckily I didn’t continue to trick myself into believing in a wrong ID. Once I pulled apart the loosely attached cap and non-hollow stem, its true identity was obvious. With any wild edibles, hopeful IDs can be dangerous. While many people have eaten false morels, they are associated with two to four per cent of all mushroom fatalities in Europe. Reportedly, their toxins can be removed by a stringent regimen of drying, boiling, rinsing, and boiling again, and they are considered a delicacy in Finland, Bulgaria and Spain. I know a Russian who eats them regularly! In contrast, Germany, Sweden, and Switzerland restrict the sales of false morels. One of the hazards of consuming false morels is that the toxin levels vary widely among populations of mushrooms. Some areas seem to grow “safer” mushrooms than others. Nobody knows how toxic any false morel will be in any location. While the false morel in North America is also known as Gyromitra esculenta, it may not even be the same species as the European false morel. So was I touching poison when I crumbled that lump along the mountain bike trail? Well, no. Touching a false morel won’t hurt you. The problem comes when you eat it, or inhale the steam from cooking. Their active toxin is called gyromitrin, and your body metabolizes it into monomethylhydrazine, a chemical found in rocket fuel. That is not something you want in your stomach. Boiling will begin to evaporate the gyromitrin, which smells chocolaty, but is not good to inhale. Gyromitrin destroys red blood cells. It damages your liver and gut. And it doesn’t take effect immediately. It takes 6 to 12 hours to develop symptoms. But by the time the nausea, cramps, vomiting, diarrhea, and fever begin, there’s not much you can do. Most people receive supportive care and recover after several days of illness. In other cases, convulsions lead to a coma and death. Even if you don’t get sick from eating a single helping of false morels the next batch might be more toxic, and repeated exposure to the toxin causes cancer in mice, and maybe us, too. All that drama is contained in a small, lumpy packet colored a beautiful shade of brown. Musical twig removed, I continued pedaling down the trail. Before I could swerve, two more false morels appeared in the center of the trail, and then shattered under my tires into a burnt sienna mess. False morel mushrooms look only superficially like the edible true morels. It is important to look closely, because an incorrect identification could make you uncomfortable. Nonetheless, they are fun to see in early spring!